Canon MG2520 ink cartridges and supplies. Guaranteed quality, discount-pricing, and same-day shipping! Remanufactured Canon Ink Cartridge, Color, High Capacity, 300 page yield. Replaces Canon part number: CL-246XL, 8280B001AA. Ink Cartridge compatible with Canon PIXMA MG2520. Remanufactured Canon Ink Cartridge, Black, High Capacity, 300 page yield. Replaces Canon part number: PG-245XL, 8278B001AA. Ink Cartridge compatible with Canon PIXMA MG2520. Genuine OEM Canon Ink Cartridge, Color, 150 page yield. Canon part number: CL-244, 1288C001, 1288C001AA. Ink Cartridge compatible with Canon PIXMA MG2520. Genuine OEM Canon Ink Cartridge, Color, 180 page yield. Canon part number: CL-246, 8281B001AA. Ink Cartridge compatible with Canon PIXMA MG2520. Genuine OEM Canon Ink Cartridge, Black, 150 page yield. Canon part number: PG-243, 1287C001, 1287C001AA. Ink Cartridge compatible with Canon PIXMA MG2520. Genuine OEM Canon Ink Cartridge, Black, 180 page yield. Canon part number: PG-245, 8279B001AA. Ink Cartridge compatible with Canon PIXMA MG2520. Genuine OEM Canon Ink Cartridge, Color, High Capacity, 300 page yield. Canon part number: CL-246XL, 8280B001AA. Ink Cartridge compatible with Canon PIXMA MG2520. Genuine OEM Canon Ink Cartridge, Black, High Capacity, 300 page yield. Canon part number: PG-245XL, 8278B001AA. Ink Cartridge compatible with Canon PIXMA MG2520. Genuine OEM Canon Ink Cartridge Bundle Pack, High Capacity, 300 page yield. Bundle pack includes: one Black (PG-245XL), one Color (CL-246XL) ink cartridge. Canon part number: 8278B005. Ink Cartridge compatible with Canon PIXMA MG2520. Known for fairly bulky all-in-one devices, Canon takes a different path with the PIXMA MG2520. This lightweight and compact inkjet printer can handle scanning and copying, but its small footprint won't take up a lot of desk space. Although Canon MG2520 printer ink is a little expensive and it lacks features like an automatic document feeder, it is still a good value for home use. The first thing many users will notice about the machine is its slim design. It measures just 5.8 inches tall, with a footprint of 16.8x12.1 inches. It weighs in at just less than 8 pounds, even with the PIXMA MG2520 ink installed, so it is easy to move around when necessary. The second thing many users may notice, however, is the lack of a preview LCD screen. This makes it a bit tougher to use in standalone mode, and most users will probably opt to do most tasks through the included software. This isn't particularly a bad thing, as the Image Garden software is a great way to edit, organize, and enhance images. Users who prefer to work from the unit's control panel may want to choose another model, however. Although the printer's low price is appealing, users may find they will spend more on printer ink then they expected. 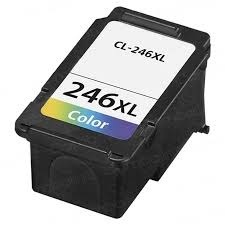 The system uses two Canon MG2520 printer ink cartridges: one black and one tricolor. This setup of a combined tricolor PIXMA MG2520 ink cartridge means colors can't be replaced individually. This will eventually mean more wasted Canon MG2520 ink compared to models with separate colors. Buyers looking for a very inexpensive all-in-one inkjet with a basic feature set might be happy with the MG2520. Those who need a few more advanced features or want to luxury of separate color supplies should keep looking for a more cost-effective model.